Facebook is the first social network with more than a billion registered accounts and users. Connect with your clients at the place they spend their time on. Imagine having the ability to show your Ads to the ideal customer you have in mind, e.g. Women, Working Professionals, Age 25 – 45 and so on. Facebook has all this differentiated demographic information when a user signs up for an account and we can help you with advertising campaigns. Facebook advertising are still in the infancy stage as compared to Google Ads, which make it’s costing one of the most attractive benefits. Facebook audience targeting is more than just interesting targeting. 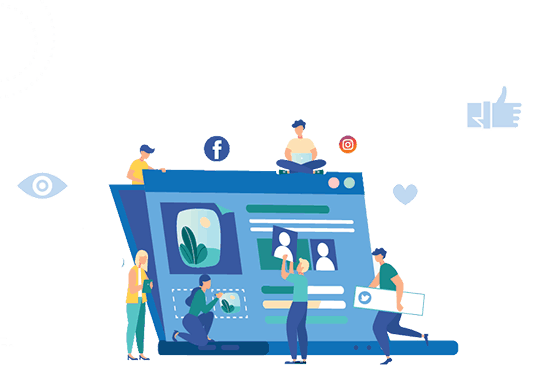 We will help setup custom audience based on users who visited our website, engage with certain post/videos or even the powerful lookalike audience that let us reach similar audiences that has converted before on our site. Canvas / Collection are one of the latest ad types in facebook advertising that are being under utlized by a lot of advertisers. It provide a full screen experience on mobile only that allow us to tell our brand/offering in a better format than other ads type. A/B testing on Facebook is essential steps to find out what works best for each campaigns. To truly achieve success in facebook, we need to be constant creating new variations of ads images, copies, different audience targeting to find out what works well to get the best possible optimization results. User generally does not convert on the first touch point of our ads thus it is important that we setup a facebook ads funnel that show different ads to user based off the actions that they have taken on our ads. Eg, if they have visited our website, we will show them a ads that give them promotion.